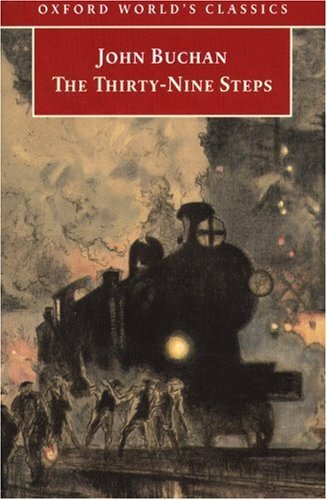 The Thirty-Nine Steps by John Buchan (1915) French title : Les trente-neuf marches. Here was I, thirty-seven years old, sound in wind and limb, with enough money to have a good time, yawning my head off all day. I had just about settled to clear out and get back to the velt, for I was the best bored man in the United Kingdom. Boredom is a dangerous feeling for it can lead you to rash decisions and that’s exactly what happens to Richard Hannay. He’s at home one night when one of his neighbours drops by and starts telling him a farfetched tale about spies and war conspiracy. His visitor whose alleged name is Scudder has just staged his own death to vanish from the sight of his enemies. Hannay finds him entertaining and only half listens to him. He doesn’t pay attention to details and doesn’t quite believes him. Hannay accepts to hide Scudder even if he thinks he might be slightly unbalanced. The rest of the novel is about his flight and I won’t go further into the plot, a lot of readers have probably read this or seen the film by Hitchcock. The Thirty-Nine Steps is a page turner, a wonderful chase across the country. The suspenseful storyline is enough to keep reading but Buchan’s style amplifies the pleasure. His sense of humour lightens the atmosphere and makes the reader smile even when the hero is in a delicate position with his foes on his heels. That was one of the hardest job I ever took on. My shoulder and arm ached like hell, and I was so sick and giddy that I was always on the verge of falling. But I managed it somehow. By the use of out-jutting stones and gaps in the masonry and a tough ivy root I got to the top in the end. There was a little parapet behind which I found space to lie down. Then I proceeded to go off into an old-fashioned swoon. The trouble is that I’m not sober. Last nicht my dochter Merran was waddit, and they danced till fower in the byre. Me and some ither chiels sat down to the drinkin’, and here I am. Peety that I ever lookit on the wine when ist was red! Candide truly believes in Pangloss’s education and he’s convinced that all is for the best in the best of all possible worlds. One day, Candide is caught kissing Cunégonde behind a curtain and is thrown out of the castle. Here starts his journey around the world, pushed from one place to the other by events and still hoping for a happy ending with Cunégonde. His belief in Pangloss’s teaching is repeatedly attacked by what he sees in other countries. His travels lead him through Europe and South America. He’s confronted to wars, earthquakes, Inquisition, fights for power, greed and desolation. I see three layers in Candide. The first one is the obvious Leibnitz-bashing dripping from Pangloss’s ridiculous philosophy. The second one is the strong criticism of hypocrisy, obscurantism and institutions. The third one is on a more individual level and questions our personal way to give our life a meaning in such a world. I haven’t read Leibnitz and I don’t know to what extend Voltaire distorted Leibnitz’s thoughts but I find Pangloss’s philosophy ludicrous and harmful. If we all think like this, then we never rebel against anything. We’d still be living in caverns since improving our living conditions is futile; after all, we live in the best of all possible worlds. With that line of thinking, we never discover vaccination, Martin Luther King preaches acceptance of your fate as a black person and women never get to become doctors or astronauts because they’ve always stayed at home. I refuse to think things can never change, especially institutions or mentalities. It’s too depressing. Then Voltaire shoots at everything that looks like an institution. The descriptions are coated with lethal irony. Armies look full of morons but still able to joyfully kill each other, murder and assult populations, especially women. The baron is full of aristocratic contempt and unable to detach himself from his snobbish ways. Candide saves Cunégonde, loves her, wants to marry her after she’s become poor, battered and ugly and still, the baron thinks Candide’s unworthy of her because he doesn’t have the right degrees of noble decent. Smart guess from Voltaire here: inability to let this go and accept equality among men will cost a lot to the French aristocracy during the French Revolution. Religious institutions and their representatives are exposed as hypocrites and deviant from the real message of their faith. The Protestant pastor preaches about love being the basis of everything and won’t help Candide who needs food and water. The Catholic Inquisition in Portugal hangs and burns people who dare stray from a floating and blurry line of conduct imposed by the Church, blatantly ignoring the Thou shalt not kill command. The Muslims are at war against each other and awful massacres are conducted in the name of God and yet they never missed the five stated times of prayer enjoined by their prophet Mahomet. In South America, the Jesuits are more a political force than a religious congregation. Voltaire never mocks or criticizes personal faith in any God. He points out the way humanity translates honest faith into religious codes and rules and rebels against using other people’s faith to achieve personal, greedy and very earthly goals through religious institutions. After all these travels, Candide and friends come to the conclusion that the best way to live is to work without disputing and that it is the only way to render life supportable. And Candide concludes with the famous Il faut cultiver notre jardin (Let us cultivate our garden) Although I’ve been taught that this statement should be taken literally, I want to see it differently. In French, we often have one word for something concrete and its related concept. Example: maison means house and home. Etre cultivé (to be cultivated) means to be farmed and to be educated. I want to see Candide’s garden as one’s brain and cultiver as to educate. I strongly believe in education to fight efficiently and long-term against obscurantism. That’s the only way to the best of all possible worlds. When I tweeted my Friday Read last Friday, I wrote “I wonder what Volaire would write today.” After re-reading Candide, I know. Sadly, he would write Candide again since everything is still valid. 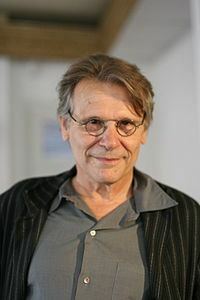 The text was adapted for the theatre by Kevin Keiss and Maëlle Poésy, who also directed the play. It was brilliant, mixing actual passages of the novella and adding contemporary references to carry the message. The actors were fantastic in picturing the emotions, the travelling and the philosophical parts. The direction was creative with lights, sound effects and décors. It brought out the fun of the text, its raw power as a thought-provoking comedy. Pangloss looked as ridiculous as the tutor Trissotin in The Learned Ladies by Molière. In France, Candide is a text often studied in high school. In class, we insist on the philosophical side and never on the funny side. Here, the production managed to preserve the serious topics and make the public laugh. A tremendous evening. Once again, the theatre proves to be the right place to expose the modernity of a text, to give life to words and show why reading books written a long time ago by guys who had funny hair brings pleasure and enlightenment. Voltaire loved theatre. I think he would love to see his text played like this and would bask in the public’s clapping. If you’ve never read Candide, it’s time to read it. You can get free copies in electronic files. It’s probably in every decent library. It’s easy to read. It’s less than 200 pages. It shows you part of the French DNA, the part that puts 3.5 million people on the streets to stand their ground for the freedom of speech and the right to criticize, not someone’s faith, but the way faith is institutionalized and weaponized (I know the word doesn’t exist) for earthly possessions and power. I have to mention an extra bonus in the leaflet I got in the theatre. Voltaire’s text was illustrated with literary quotes. One of them was by Romain Gary. Aussi longtemps que des phares de la pensée humaine prétendront au monopole de la lumière, il ne saurait y avoir que des successions d’éclairs de lumière et de ténèbres, de foi et de désillusion, d’excès dans la croyance et dans la démystification, de fanatisme et de retrait, de croisades sanguinaires suivies d’une haine du mot même de foi, de dévouement total puis de nausée totale, le genre d’amoralisme qui vient d’une morale trop rigide, puis à nouveau le genre de morale rigide qui procède d’un excès d’amoralisme. In L’Affaire homme. As long as beacons of human thinking pretend to have the monopoly of light, we will only experience a series of lightning of enlightenment and dark ages, of faith and disillusion, of excesses in beliefs and demystification, of fanaticism and retreat, of bloodthirsty crusades followed by hatred of the very word of faith, of total dedication and then total nausea. We will only live through the sort of amorality that comes after a too rigid morality, then through another time of rigid morality that is born from an excess of amorality. Le Journal d’un corps by Daniel Pennac. Regular readers of this blog know that I love theatre. There’s something special about seeing flesh and blood actors a few feet away from you, impersonating characters and telling a story night after night for an audience. Perhaps it resonates with childhood memories of listening to stories before bedtime or the pleasure comes from the knowledge that these actors are playing for us, the people sitting there and not for a camera. In a way it’s more personal. When my professional schedule leads me to Paris and there is time, I always look for a theatre play to watch. Last week was Mass Appeal and this week, it was Le Journal d’un corps by Daniel Pennac, with Daniel Pennac. If you’d looked inside my head when I found out about this on my usual theatre website, you would have seen my brain doing cartwheels in there. That’s how happy I was. 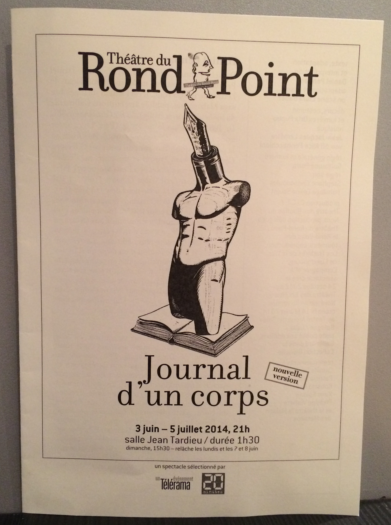 I had loved the book Le Journal d’un corps and I’ve written about it here. I’ve been a Pennac fan for a long time now, loving the Malaussène series (see Guy’s review here) and his memoir about teaching, Comme un roman. It’s in this very book that Pennac lists the 10 Inalienable Rights of the Reader which are also advertised on my blog. Bref, he and I have a long story of one-sided admiration, my side of course. So, I felt like a teenager going to see her favourite rock star playing unplugged. My brain was doing cartwheels again, after the show. That was amazing, he was amazing. The concept of seeing an author reading his book is appealing to a bookworm, per se. The concept of seeing a writer impersonating his words is mind-blowing. When you read a book and the writer is a real author, you hear their literary voice. There’s no way to know if this voice is their natural voice or if it’s ventriloquism. For Pennac, his physical voice matches his literary voice. His voice is a little nasal, conveying the irony, the wit of his words. He’s a gourmet of words and he lets them roll around his tongue, reaching his taste buds and gives them back flavoured with good humour and passion. His lower jaw gives a special texture to his voice and a unique rhythm to his sentences. His eyes are a bid hidden by Harry Potter glasses but his mischievous look escapes their metallic frame, revealing his rebellious side. Everything in Pennac’s body speaks of childhood, play and of his healthy appetite for life and language. This is what I felt when I read Le Journal d’un corps. This is what I saw on stage, and I was sitting in the third row, quite close and with a clear view. How often do we have the opportunity to see a writer on stage, ten meters away, living his text on stage. Not reading it, playing it, turning the writer into an actor, giving life to his own words. Not often. He has the ease of excellent actors and teachers. I would have loved to sit in his class and hear him read masterpieces aloud. Apart from the performance, the play reminded me how good the book is. It’s funny, accurate in its rendition of the human condition, universal and particular at the same time. If you’re French and you have the opportunity, go to the Théâtre du Rond Point and watch Pennac on stage. For foreigners, there’s always the book, sadly not translated into English. Yet. PS : Post publication of this billet, I asked Folio whether Le Journal d’un corps will be translated into English. Good news for UK readers, MacLehose Press will publish it. Publication date still unknown, though. New visitors of these blogs don’t know what it means. Copinautes know pretty well that I was ecstatic: a novel by Romain Gary, made into a play! I HAD to see that. My previous experiences with Gary on stage were all excellent. I’ve already seen Gary/Ajar where Christophe Malavoy impersonated Gary telling his life. The text was adapted from souvenirs by André Asseo, Gary’s friend from high school. Jacques Gamblin also read Gary on stage, using the texts of his fake interviews gathered in La nuit sera calme and I’m not quite recovered from the disappointment of missing this one. La vie devant soi (Life Before Us) has been made into a very successful play with Myriam Boyer as Madame Rosa. And the theatre version of La Promesse de l’aube (Promise at Dawn) was a delight to see. Romain Gary might be unknown in the Anglophone literary world, but in France he keeps interesting readers and theatre directors. And his texts bear the stage adaptation very well. I wrote a billet about Gros Câlin (literally “Big Hug” or “Big cuddle”) as we read it with our book club in 2011. 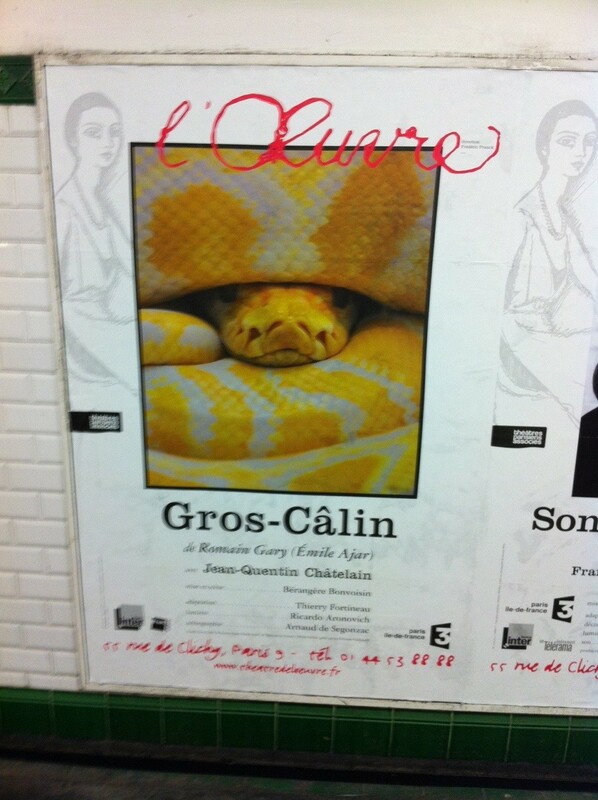 It is the story of M. Cousin who lives in a two-bedroom apartment with a python named Gros Câlin. This is the first novel Gary wrote under the pseudonym of Emile Ajar. Cousin describes his life with his python and it’s both hilarious and sad. It’s comical because Cousin sees life through distorting glasses. He’s fond of his python because he loves to be hugged by Gros Câlin, it helps for his desperate case of loneliness. M. Cousin is in love with his colleague Mlle Dreyfus and he explains their interactions in the office in the middle of his dissertation about pythons and the anecdotes about his life with Gros Câlin. The play version is faithful to the novel. Jean-Quentin Châtelain played a convincing Cousin. His playful tone put forward all the fun of the text, showed how crazy Cousin is sometimes. He never crossed the fatal border of farce. He managed to be pathetic when Cousin is and he let us know that behind that façade of craziness was hidden a troubled and lonely man. In the novel, there’s an episode when the python goes to the apartment below by slipping into the toilet pipe and caused a fright to the neighbour by accidentally brushing against her bottom while she was using the toilet. When Châtelain told this on stage, the whole audience was shaking with laughter. The setting was sober, made with mosaic tiles that reminded me of the skin of a snake. The lights were well used, not too much. It’s a challenge for the actor: he’s alone on stage and leads the show during 1:30 hour. Impressive. As good as the actor and the direction were, the real star is Romain Gary himself and his wonderful way of playing with the French language. It’s unique and he reinvented himself when he wrote under the name of Emile Ajar. M. Cousin is Gary’s imaginary relative. He plays with words. He slips, twists the grammar, speaks in riddles, uses one word for the other and yet keeps the sentence intelligible. Chien Blanc starts with Gary watching a python in the Los Angeles zoo and interacting with it. I wonder if Gros Câlin stemmed from this observation or if the choice of a python has something to do with Gary’s love for the Monty Python. If you can read in French, Gros Câlin is worth a try. I exited the theatre with a huge grin on my face and an ache in my jaw muscles due to laughing out loud so much. My next billet will be about Victor who lives in a two-bedroom apartment in Kiev with a penguin. He doesn’t have a Miss Dreyfus to dream about but he has a Nina in his life. 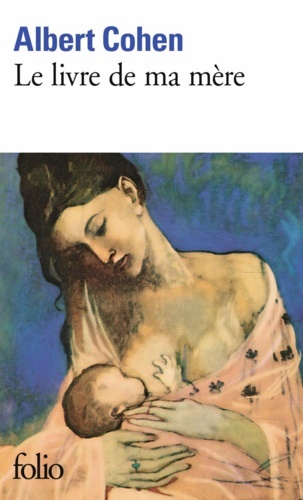 And Nina was the name of Gary’s extraordinary mother, the heroin of La Promesse de l’aube. La boucle est bouclée. I’m a little late to write about our Book Club choice for August, sorry. Actually, I have so many things to say about The Odd Women that it took me a while to find the quality time necessary to write my billet. I introduced the book in a previous billet , we’ve had our Book Club meeting and I’m delighted to say that this novel exceeded our expectations. The Odd Women opens in the Madden household. Dr Madden is a country physician, a widower living alone with his six daughters. We’re in 1872 when he dies in a carriage accident. Mrs Bennet’s worst fear becomes a reality for the Maddens: six unmarried daughters, no relatives, no income, no perspectives. The girls must fend for themselves. Then we fast-forward in time and we’re now in 1887. Only three daughters have survived: Alice, Virginia and Monica. 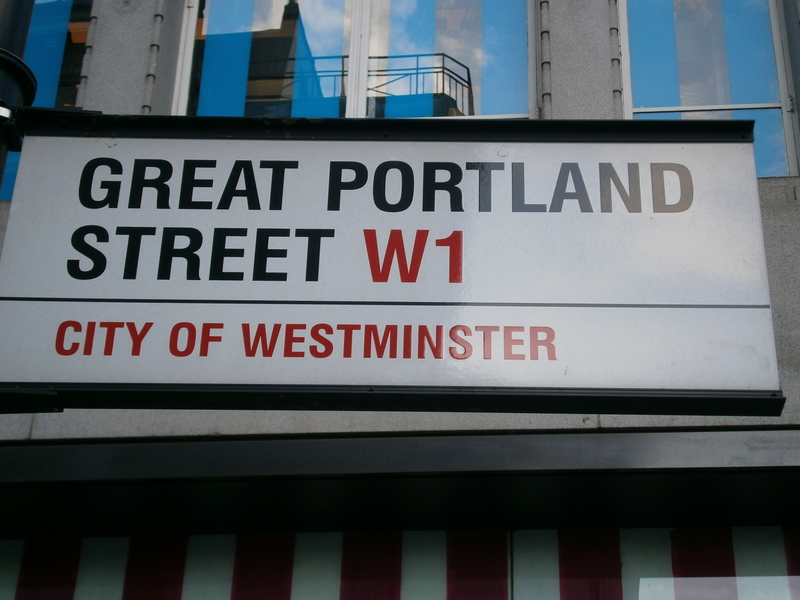 Alice works as a governess; Virginia is between two governess positions and Monica works as a shop girl. Virginia and Monica live in London. A commendable and sensible goal. (20 years from there, the Great War will take care of training the “reserve”). Following her first meeting with Rhoda, Virginia entertains the idea to start a school for girls in the country and run it with Alice. Rhoda also meets with Monica to convince her to quit her job at the shop and join her school to be able to find a clerical job in the future. Monica is at a turning point in her life as Miss Nunn’s offer happens at the same time she is courted by Mr Widdowson whom she had met in a park. He is besotted with her and soon proposes. Monica accepts although he’s much older than her and she perfectly knows that she doesn’t love him. She felt no love in return; but between the prospect of a marriage of esteem and that of no marriage at all there was little room for hesitation. Rhoda disapproves of her marriage because she thinks that financial security is a bad reason to get married. Miss Barfoot lets it go, accepting that Monica isn’t built to remain single. At the same period, Miss Barfoot’s cousin, Everard Barfoot, is back in England after years of living abroad. He’s single and perfectly happy that way. He’s against marriage having witnessed disastrous ones among his friends. He becomes highly interested in Rhoda when he discovers she’s a woman who doesn’t look for a husband. She’s against marriage too and thinks that her being single and successful is an example for the girls she trains. Everard sees it as a challenge to make her fall in love with him and throw her principles to the wind. He starts courting her. Will he win his bet and how will it affect him? The whole novel gravitates around the two couples, thoughts about the institution of marriage and the condition of women. The question of marriage is predominant in the novel. For Gissing, it has reached a point where it is poisonous for everyone. He questions the possibility to get married, the marriage itself and its termination. The first problem is that since genteel married women aren’t supposed to work, a man needs to earn enough money to afford a wife. The first example is that of Mr Bullivant, who works at the same shop as Monica and chases after her. She doesn’t like him and uses rational arguments to push him away. Everard is the living example of Austen’s statement in Emma when Mr Knightley declares Men of sense, whatever you may chuse to say, do not want silly wive. Everard would rather be a bachelor than be burdened with a woman he doesn’t consider as his equal. Before Rhoda, he thought no woman on earth could be his match. Contrary to Everard, Widdowson represents the old-fashioned vision of marriage and women. Widdowson, before his marriage, had never suspected the difficulty of understanding a woman; had he spoken his serious belief on that subject, it would have been found to represent the most primitive male conception of the feminine being. Women were very like children; it was rather a task to amuse them and to keep them out of mischief. In the traditional way of thinking, women are barely above the animal –I suspect some men thought their horse was more intelligent than their wife—and like children, need guidance. The poor and jealous Widdowson sees himself as a pastor for Monica and this belief combined with his possessive love turns him into a tyrant. Unsurprisingly, Widdowson has trouble interacting with Monica, who, even if she’s not as radical in her behaviour as Miss Nunn, has nonetheless stayed long enough in her company to behave like a feminist. He sees her as his possession and is puzzled when the living object he calls a wife thinks, objects and makes decisions of her own. Gissing is revolutionary in his vision of marriage. In his opinion, marriage as it is can only lead to unhappiness. He advocates a marriage based on love, equality and trust. He writes clearly that it should not be permanent when these criteria aren’t met anymore. How many marriages were anything more than mutual forbearance? Perhaps there ought not to be such a thing as enforced permanence of marriage. But—perhaps, someday, marriage would be dissoluble at the will of either party to it. Perhaps the man who sought to hold a woman when she no longer loved him would be regarded with contempt and condemnation. This vision is close to mine and it’s rare that I agree with a Victorian writer about marriage and relationships. Usually, I don’t share their views and take them for what they are, a reflection of their era. If Jane Austen is discreetly subversive, Gissing is openly subversive. Marriage shouldn’t tie couples forever; women should have the right to work according to their skills. Both men and women should have the choice to select a profession they enjoy. They should decide to get married or not. His feminism is blatant and I’ll write more about this in another billet. Austen and Gissing are subversive because they put the happiness of the individual before the needs of the society. Perhaps Austen is an heir of the Enlightenment; after all the right to pursue happiness is in the Declaration of Independence of United States, written at that time. In any case in Pride and Prejudice, the main characters consider that their happiness is more important that what the society wants from them. Elizabeth first refuses to marry Darcy, even if this alliance would provide financial security to her whole family and Darcy prefers to marry out of his social class to have a wife he loves. Gissing shows what marriages of convenience do to people. Monica’s choice is a disaster but the author also gives other examples such as poor Mr Poppleton who married a silly wife or Everard’s brother who married a selfish and whining one. This is a militant book and yet, the novelist is not set aside by the activist. The characters are subtly drawn, Gissing investigates their inner minds, dissects their feelings and thought processes. He pictures their hesitations, their struggles against their ingrained vision of the world and relationships. Through their difficulties, he shows how hard it is to change of mind set. It serves his cause and makes of The Odd Women a compelling page-turner. Gissing seemed like a city Thomas Hardy in the way the events unfold. Apparent fate and coincidences play a role in the story. I say “apparent” because, like in Hardy’s Life Little Ironies, the coincidences are more like the collateral consequences of tiny decisions made by one of the protagonists than sheer chance. I absolutely loved this book both thought provoking and entertaining, the best combination in literature. We all loved this novel and I’d buy it in French for every reader around me if it were translated. This new Book Club year starts divinely. PS: Once again, thanks Guy. Read his excellent review here.